BEIJING, Dec. 5 -- A fossil of a toothless flying pterosaur, with a body bigger than some family cars, represents the largest of these extinct reptiles ever to be found and has forced the creation of a new genus, scientists announced on Thursday. 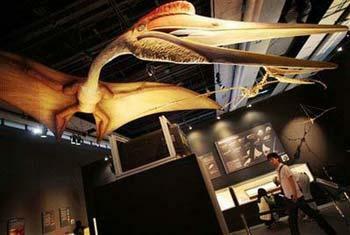 Pterosaurs ruled the skies 115 million years ago during the dinosaur age. They are often mistaken for dinosaurs. Mark Witton of the University of Portsmouth identified the creature from a partial skull fossil. Witton estimates the beast would have had a 5.5-yard (5-meter) wingspan. It stood more than a yard (about 1 meter) tall at the shoulder. "Some of the previous examples we have from this family in China are just 60 centimeters (about two feet) long - as big as the skull of the new species. Put simply, it dwarfs any chaoyangopterid we've seen before by miles," Witton said. The finding also is significant because it originated in Brazil and is the only example of the Chaoyangopteridae, a group of toothless pterosaurs, to be found outside China. Witton has christened the new species Lacusovagus, meaning "lake wanderer," after the large body of water in which the remains were buried. The findings are detailed in the November issue of the journal Palaeontology. He was asked to examine the specimen which had lain in a German museum for several years after its discovery in the Crato Formation of the Araripe Basin in North East Brazil, an area well known for the its fossils and their excellent state of preservation. However, he said that this fossil was preserved in an unusual way, making its interpretation difficult. "Usually fossils like this are found lying on their sides but this one was lying on the roof of its mouth and had been rather squashed which made even figuring out whether it had teeth difficult," Witton said. "Still, it's clear to see that Lacusovagus had an unusually wide skull which has implications for its feeding habits - maybe it liked particularly large prey. The remains are very fragmentary, however, so we need more specimens before we can draw any conclusions." The discovery of this pterosaur fossil in Brazil, so far away from its closest relatives in China, demonstrates how little scientists still know about the distribution and evolutionary history of this group of creatures, Witton said.